Articles of Confederation research papers discuss the original agreement between the first 13 American states that formed the national government. 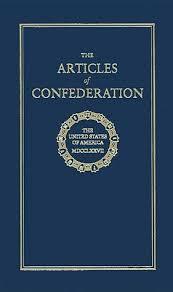 Research papers on the Articles of Confederation illustrate that it was the original agreement between the first 13 American states to form a national government. The plan was originated in the middle of 1776 by the Second Continental Congress and ratified by 1781.Your research paper will want to show how it was a loose confederation with a weak central government, and was quickly replaced by the U.S. Constitution of 1787, which went into effect in 1789. Following the Declaration of Independence, a committee, led by John Dickinson was formed to create a national government framework. By 1777, this draft was sent to the states for ratification. Two of its major weaknesses were the inability of the government to conduct foreign policy and inability to collect taxes. Congress could only request money from the states, a situation that frequently left the federal government short of cash. The states also retained control over their own commerce, making thirteen different trade policies in one nation. The Articles of Confederation can be read at the Library of Congress. However, by 1786 the limitations to the Articles were apparent. The Annapolis Convention that year called for a Constitutional Convention to meet in Philadelphia. States' Rights research paper discuss the constitutional issue usually denoted by the phrase “states’ rights,” i.e. the power relationship between state governments and the federal government. Tenth Amendment research papers look at the 10th Amendment of the United States Constitution. Order a research paper on the tenth amendment from Paper Masters. Eighth Amendment research papers - Since the ratification of this amendment there has existed extensive debate regarding what was considered, “cruel and unusual” by Americans. Paper Masters writes custom research papers on Articles of Confederation and discuss the original agreement between the first 13 American states that formed the national government.